Egyptian Heroes is 5 reel, 20 line, ancient Egypt-themed game with Free Spins, Sticky Wilds and Pyramid-sized cash prizes! Players who journey back to the age of Pharaohs will discover the Golden Bet Line. This exciting new feature multiplies winnings on a random bet line up to 5 times! Egyptian Heroes brings an ancient world to life with eye-popping visuals and first-rate sounds effects. Your players will love it! 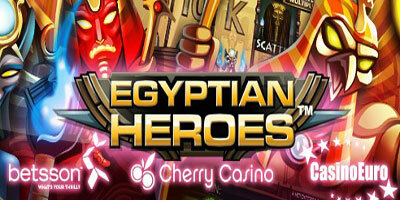 PLUS, to mark the release of Egyptian Heroes is offering players 10 FREE spins, is offering 5 free spins! Egyptian Heroes™ is the latest Smart Range offering from Net Entertainment introducing the Golden Bet Line feature – a randomly selected bet line which has a random win multiplier ranging from x2 – x5. Golden Bet Line is active on every spin, and comes at no additional cost to the player, pushing the excitement and experience to new levels. In addition to the Golden Bet Line, Egyptian Heroes™ offers even more chances to win through Expanding Wilds and a Sticky Expanded Wild in Free Spins. In the main game Wild symbols expand and cover reels 2, 3, or 4, when they complete winning bet lines. During Free Spins the Expanding Wilds are still active and the third reel is replaced entirely by a Sticky Expanded Wild. This creates the possibility for 9 out of 15 symbols to become Wild on a single spin giving the chance at some really huge wins. Egyptian Heroes™ appeals to all players and presents a refreshed Egyptian mythology theme, animations and features never seen before. Pharaoh-sized fortunes could be just around the corner in this 5 reel, 3 row, 20 line game with a maximum win of € 200 000 per bet line. Egyptian Heroes Game RulesEgyptian Heroes is a 5-reel, 3-row video slot featuring a Golden Bet Line™ with multiplier, Wild substitutions, and Free Spins with a Sticky Expanded Wild. You can play 1 to 20 bet lines at different bet levels and coin values. The spin button plays the game at the current bet lines, bet level, and coin value. MAX BET plays the game at the maximum bet lines, highest bet level, and the current coin value. Bet line wins are multiplied by the number of coins bet per bet line. Wild symbol substitutes for all symbols except scatter symbols. Only the highest win per active bet line paid. Some features may not be available in PLAYING FOR FUN mode. Every spin has a chance to win on the Golden Bet Line™. Golden Bet Line™ wins pay the bet line win amount multiplied by the Golden Bet Line™ Multiplier (x2 – x5). The Golden Bet Line can be an inactive bet line. Free Spins3+ scatter symbols activate Free spins. Free spins are played at the same bet as the round activating Free spins. Additionally, Wild symbols on reels 2 and 4 expand when completing winning bet lines. In Free spins, 3+ scatter symbols activate additional Free spins. Any Free spins won are automatically added to the current Free spins. Find This Exciting Slot Machine Game At The Trusted Casinos Below! - 50% deposit bonus up to €500. - Get your Goldwin bonus and free spins now!